You may have heard something about ‘branding’ in regards to marketing, but perhaps you’ve wondered what that means exactly. Branding Business Tips. Sometimes it is better to explain something in relation to something else. That’s what I am going to do – so first I will start with ‘positioning’. You also may have heard that term, but also did not really know what it meant. ‘Positioning’ is a marketing term that means to take a product or service and “position” it in the mind of your prospects/clients by comparing it with or against something already familiar in their minds. Al Reis and Howard Geltzer first published a book about it in the 1970’s. To give you an idea of positioning, take Avis. Hertz car rental already had first place in the market. By being first place, they preempted that position. Everyone knew that they were #1. So, Avis, to get any recognition at all, had to position themselves with Hertz, but actually couldn’t take their spot. Do you recall what they did? You got it – “Avis. We try harder.” By positioning themselves as the best second runner up, they were able to capitalize on a larger portion of that market. Some people think branding is like positioning, but it is different. The main difference is that positioning is a fluid concept. In other words, you can position yourself at different times in different markets as different things. Branding is more set in stone- it’s a hard-core recognition factor. To give you a better idea, the other day one of my subordinates saw a cup of mine with red circles on it. He said it looked like a ‘Target’ cup. That is branding. That red target logo is branded in that person’s mind. He saw it and immediately thought of the chain store. However, Target is positioned differently – it’s discount chain with good style. Some people even refer to it as ‘Targé’ – that is positioning. It positions the store with some hoity-toity posh boutique but everyone knows it’s right there with Walmart price wise. Good position. Branding is more about the following of rules because if you don’t follow those rules, things don’t look the same and people won’t remember you. What if you changed your body periodically – I mean really changed your body. “Oh, today, I think I’ll be Asian – straight black hair, slanted eyes” – but yesterday you were Caucasian; how do you expect anyone to remember who you are when they see you on the street? It is kind of the same. When you put out your marketing pieces, you want to create a similar look and feel so that people remember you. And you want that similar look and feel on every thing you put out. The good thing is that you get to make the rules…colors the same, style of lettering the same, logo etc. And there is some flexibility as long as you follow the rules. You can’t go too far out of bounds, but you can change some things within the frame of what others can still recognize. There was an actual study done by GE (General Electric). They found out that it only takes 22% of their logo for people to recognize. Only 20% of their logo needs to be seen before people recognize it. So, it sort of is like the Western concept of branding your cattle – making sure people recognize what is yours. Remember I said ‘the same look and feel’? Well, the other side of branding is what it makes you feel about it. Chevrolet used to say it was America’s vehicle – baseball, hotdogs, apple pie and Chevrolet. Now it is “like a rock”. That makes you feel a certain way about it. It still is in line with the old idea about Chevrolet. Americanism = loyalty = dependable = Chevrolet. That song that comes on is their brand. Being America’s vehicle is their position. Both give you a certain feel. Branding in your marketing has to make you feel something. A technology company can’t have an old style font – you might not think they were very far advanced. Take PostcardMania. Our colors, bold style font and humorous quips give you the feeling that we are happy and lively. We make sure that our prospects and customers get that same feeling every time they see our mail, emails, packages, logo, etc.. Therefore it is important to look the same every time. Take a dry cleaner for example. His postcards, packaging, hangers, etc. need to have his logo, colors and font all the time all the same - on everything. That way when people receive his postcards in the mail, they look for what specials that he has because they already like him and have him identified in their mind as something they are familiar with. If he is constantly changing what he looks like, when they get his postcard they don’t know whether they are looking at his specials or what some dry cleaner in general is offering. If they are already familiar with him, they are most likely going to pause and look at what he has to say. Branding is just like the old coat of arms that families used to have connected with their name. It would instill respect, fear, and wealth - whatever. Likewise, a country’s flag gets people to feel a certain way about their country. Heck, Stalin even used branding! He used the same picture to portray who he was to his people - I am this, I am this, I am this – he wanted them to think a certain thing. It’s really not a new idea – I’m trying to get you to see it has been around for quite some time. At PostcardMania, we want people to recognize that we know how to get their attention – bright colors, loud type – shows that we know what we’re talking about in terms of marketing. But ‘Postcard Marketing Experts’ is our positioning. Does that make sense? You can see how the two tie in together. One is our position and one is our brand. We’re hoping to create a feeling of being expert, the best in the business, etc., but also friendly and easy to confront. Think about what message you want to portray. What do you want recipients of your promotion to think about you? What image of your company do you want to put out there? That is your brand. When people see you continually as one thing, they begin to expect the same from you and they get used to you. Remember when Pepsi came out with clear Pepsi? People freaked out. They didn’t want to drink it. It was a flop. It wasn’t what they were used to – so it didn’t even taste the same to them. 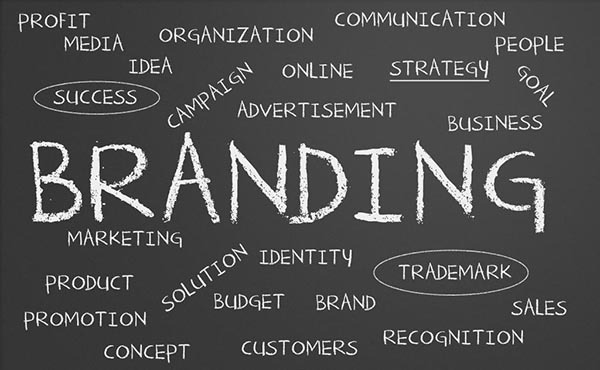 Branding in marketing is recognition – color, font and logo – keep it the same. If you can get them to remember what it is you are selling, the more likely they will come in and get it…if not, you are depending on drive by traffic and are wasting your money in marketing. And don’t forget this very important marketing truth – if you’re only planning to promote merely one time then branding is not going to help you. Branding is only for marketers that already understand the concept of repetition.